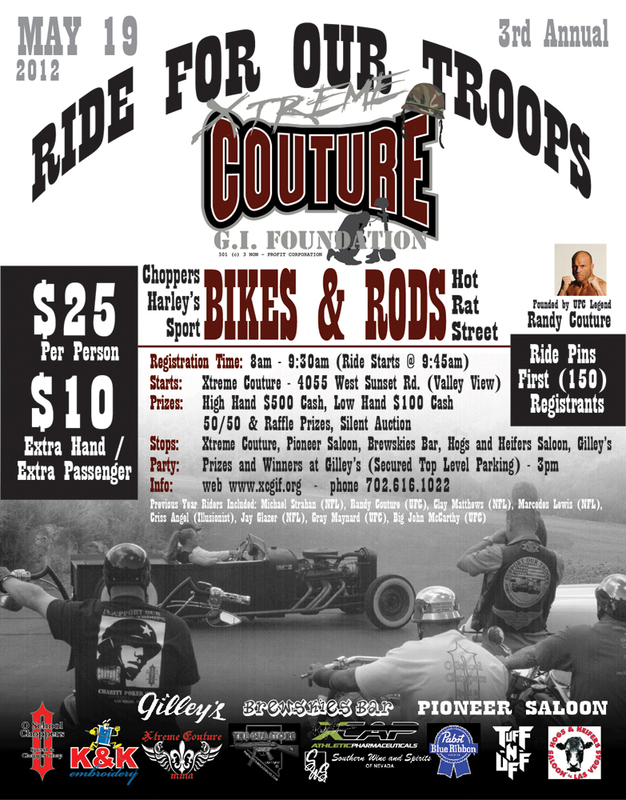 Join Randy Couture for his 3rd Annual Bike and Rod Poker Run on Saturday, May 19, 2012. All raised funds go toward helping injured Veterans. **** All Bikes are Welcome! **** Hot Rod, Rat Rod, Street Cars Pre 1960 are Welcome! If you don’t want to drive em, SHOW em! Registration will be from 8:00am-10:30am at Xtreme Couture MMA located at 4055 West Sunset Road, Las Vegas, NV 89118 * 702.616.1022 (Corner of Valley View) less than a mile from Las Vegas Blvd. Additional poker cards can be purchased for $10. This motorcycle charity event entails 5 stops in a 100 mile planned route where participants will receive a poker card at each location. Locations that are participating are: Xtreme Couture MMA, Pioneer Saloon, Brewskies Bar, Hogs and Heifers and Gilley’s inside Treasure Island on the Strip. Cash prize for best hand is $500 and worst hand is $100 plus additional prize pool for 2nd and 3rd place. At registration you can purchase Rafffle tickets for more great prizes, 50/50 Cash Raffle plus private party and live entertainment at the last stop Gilley’s. Please note: We have the entire top level of the parking garage at Treasure Island which is closed off the the public and will be monitored by security. Your bikes and cars will be safe while you are inside Gilleys. Don’t ride or have a custom car that’s ok you can still show your support by coming to registration to purchase a ticket to the private party at Gilley’s and enter to win in the raffe! (Las Vegas, NV January 29, 2010) Randy Couture Continues to be a class act both in and out of the Octagon. This time Couture gives almost $50,000 worth of supplements to America’s Hero’s Wounded In Action. Perhaps the most recognized name in mixed martial arts (MMA) and true role model to those in the sport, Couture continues to lead by example. Couture, has shown to be an inspiration to the masses outside of MMA as well. Excelling in almost anything he has ever done, from wrestling, to MMA, to acting, Couture always gives back, and most of the time people will never hear about it because he does it for the cause not the publicity..
International Journalism Review (IJR) commends Randy Couture’s most recent donation to the Walter Reed Medical Center to help America’s wounded soldiers. Couture donated $49,278.93 worth of supplements (now known as XCAP) to help aid in their rehabilitation and recovery. Randy Couture served 6 years in the US Army before his incredible and ongoing career in the Ultimate Fighting Championship (UFC). Coming off a seemingly easy win over top ranked Brandon Vera at the age of 46 is just another notch on Couture’s belt of life. In 2007 Randy Couture formed a non profit organization called Xtreme Couture GI Foundation to raise money and increase awareness for those wounded in action and their families. This past December Randy made a visit out to Walter Reed where he had the privilege of meeting many of the injured troops and while on his trip Couture donated $100,000 in cash that had been raised through the GI Foundation to 10 families in need. For more information on his non-profit organization and or would like to donate to his foundation for this great cause please visit www.xtremecouturegifoundation.org. If you are interested in Randy Couture’s XCAP supplement line you can visit www.xcap.tv. Teams and players starting arriving in groves at the paintball complex (A Pirates Paradise) today in Mesquite, NV for the Xtreme Couture GI Foundation Event – Xtreme Combat Weekend. made possible by Randy Couture. This weekend is all about celebrating and honoring the men and women who serve and sacrifice for our country every day. In their defense of our freedom, our armed forces are truly the ones to thank for making this weekend possible. When driving into to the complex it resembles something you might see on your desktop wallpaper or a postcard and it’s just want the serious scenario paintballer wants! The teams were setting up camp and gearing up for a weekend of fun most were also talking about the MMA fights Saturday evening at the Casa Blanca Hotel and Casino presented by Tuff-N-Uff. Sources close to XC confirmed that Dana White, president of the UFC was planning on coming up to the fight event this weekend as well. Before game play started today teams and players were allowed out on the field for a walk through. Here are a few images of this 40 arce complex that includes mountain terrain, rivers and of course …..
For only $50 to play paintball all weekend and $20 to watch MMA fights that all proceeds goes to benefit our Military Troops and is a tax write off what other reason do you need? So tomorrow get in your car and make your way to the event!!! We also want to thank all our volunteers and staff working the event for a great job!! Join Randy Couture, other MMA fighters and friends for a weekend of xtreme paintball, mma fights Saturday night presented by Tuff-N-Uff where ALL proceeds from the event is going to help benefit injured soldiers. Full Tilt Poker.Net has joined forces with Randy Couture to help raise money for Randy’s Charity this weekend August 23rd for the Xtreme Couture GI Foundation. You’ll need to only put up $20 to play and half of each entry will go towards the prize pool and the other half is a donation directly to the GI Foundation. So if you want to help our men and women who protect and serve our country now is your chance. Tournament Starts at 4PM (PST) – Sign Up early…..
Make an account on Full Tilt Poker.net – put $20 bucks in your bank. Go to money game and find tournament # (102317041) and the Sign-Up code is “Couture”. Pass the word!!!!!!!!!!!!!!!!!!!!!! Let’s help our G.I.s!!!!! Xtreme Choppers raising money for charity. The Xtreme Couture G.I. Foundation together with O School Choppers hosted a Motorcycle Poker Run last weekend to help raise money for wounded soldiers and their families. The event started in the early hours of Saturday and ran all the way till the evening when everyone relaxed, ate some BBQ, and won some prizes from the raffle. This ride was the first of what will become an annual event held with the guys from O School and us here at Xtreme Couture. The riders started off at Xtreme Couture then began the 150 mile run that took us everywhere from Pioneer Saloon way out in Good Springs all the way back to Mr. Dee’s, stopping at O School Choppers and the Moutain Springs Saloon along the way. Here are some pictures from throughout the day. It goes without saying everyone enjoyed themselves and I personally look forward to next year, where the ride will surely be bigger and better then ever!